The Northwestern College assessment system is designed to gather data around the model of the teacher education. The unit uses the Charlotte Danielson (2008) model to gather and examine data. The system gathers data around multiple assessment points and assesses candidate performance, content knowledge and dispositions. Data is gathered around an assessment cycle and examined each fall at a departmental retreat. Although we have collected data in the past, our 2009 visit report has encouraged us to gather data and analyze it more effectively. Departmental response to the data has encouraged the department to make programmatic change a priority. Candidate assessment is gathered at multiple data points. Three formal gates are part of the system. Student data is examined at application to the program, application to student teaching, and recommendation for licensure. Informal gates include advising sessions each semester in which elementary candidates are assigned to an adviser in the department and secondary candidates are assigned to an adviser in their field and then asked to visit with one of the two secondary specialists. All candidates are required to take and pass Praxis I for entry into the program. All candidates are required to take and pass Praxis II, both content and pedagogy, for licensure in Iowa. Program assessment is gathered using candidate assessment for the base. This candidate data is examined in a yearly assessment cycle. Program data is also gathered using series of surveys. This data is examined yearly and posted online at this location. The Northwestern College assessment system addresses the work of the teacher education program as a whole and the elementary education major and secondary endorsement minors. Data is disaggregated by major. The Northwestern College assessment system facilitates the progress of candidates toward licensure. Data points are also used to examine the work of the unit. Candidate GPAs are examined at three data points. Candidates must have a 2.5 overall GPA to enter the program and take restricted classes. Candidates must maintain the 2.5 GPA to be recommended for student teaching. Candidates must have a 2.5 GPA both in their major and overall to be recommended for licensure. The unit seeks feedback for each candidate in the form of a department recommendation. Candidates are not allowed to be admitted into the program until they receive a recommendation from their major department. All candidates must take and pass the C-BASE entrance test and the Praxis II and PLT exit tests. The C-BASE test assesses general education skills in reading, writing, math, science and social studies, as a step for admission into the teacher education program. The education department requires a passing score in each of the reading, writing and math sections. A passing score is 235. All students must take examinations in content (Praxis II) and pedagogy (PLT). Passing scores are determined by Iowa state standards. Northwestern College follows state requirements and assists candidates in securing Iowa licensure. The entrance portfolio is required prior to entering the program. Candidates document their progress on the four domains of the Danielson Model. Additional items related to the Northwestern College Teacher Education Program Model are also required. Completion of the Praxis II content test, PLT test and an interview are required upon exit. The exit interview is now used for evaluation. When students apply for admission into Northwestern's teacher education program (on LiveText), they will be asked who will be completing the disposition survey on their behalf. Candidates will choose five names of people on campus (faculty or staff) to complete the disposition form for them. The list of names is to be emailed to the education department assistant. The student cannot choose their adviser or more than two faculty members from the education department. Students may choose a resident director, a coach or work-study supervisor to complete the survey as well. Recommenders will receive the disposition form by email link and complete the form in LiveText. We have also begun assessing dispositions in two of the first education classes that students take, EDU 102 and EDU 206, utilizing the same form. The Northwestern College assessment system addresses the work of the teacher education program as a whole: the elementary education major and each of the secondary endorsement minors. Program evaluation data includes feedback from student teachers, cooperating teacher, supervisor, first-year teachers and administrators of first-year teachers. 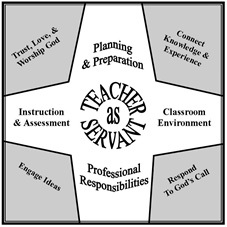 Data is collected on the Danielson Model, as well as the Northwestern College teacher education program. Data is aggregated and examined yearly. Program changes are proposed and made on the basis of this data. C-BASE was used as the entrance test for admittance into the program for 2017–18. All candidates must receive a passing score prior to admission. Students must score at least 235 on each testing sections of English (reading), writing (essay) and mathematics. Content knowledge is measured at an exit level using GPA (as noted above) and exit Praxis II tests. All candidates must receive a passing Praxis II score in their major area, as well as either a passing edTPA or PLT score, prior to licensure. Program evaluation data includes feedback from student teachers, cooperating teacher, supervisor, first-year teachers and administrators of first-year teachers. Candidate and program data are collected on the Danielson Model, which is the foundation of our conceptual model. Specific programs are also aligned to various sets of national standards, and program assessment data is collected and analyzed as required for our national accreditation. Common lesson and unit plan rubrics are utilized, as well as consistent evaluation forms for field and clinical experiences. Student teachers are sent a survey online at the conclusion of their student teaching experience. Results are tabulated and presented for program evaluation yearly. Elementary and secondary program data are separated within the linked documentation. The cooperating teachers and supervisors complete a final evaluation form of the student teacher at the conclusion of each student teaching experience. Results are tabulated and presented for program evaluation yearly. Elementary and secondary program data are separated within the linked documentation. Administrators of first-year teachers are sent a survey from the Iowa State Department of Education. Results are forwarded to Northwestern College's education department. This document is a summary of those survey results. First-year teachers are sent a survey from the Iowa State Department of Education. Results are forwarded to Northwestern College's education department. This document is a summary of those survey results. Average cost of attendance: $39,200 for 2017–18. The average financial aid package (minus loans) for Fall 2017 was $21,750, for an average out of pocket cost of $17,450. Average beginning salary of a program completer: $36,362 for 2017 graduates responding to the Career Development Center (CDC) Survey sent to all graduates. Placement patterns of completers: Results from the 2016 and 2017 CDC outcomes survey show that 72% of graduates were employed in Iowa. 88% were employed in Iowa or the surrounding states (MN, NE and SD, in that order). Urban areas include Sioux Falls, Omaha, Lincoln and Minneapolis. Nearly 100% of Northwestern education graduates are in the Midwest/neighboring states (IA, MN, SD, NE, CO, IL, WI and KS, in decreasing order). Most are working in smaller towns/school districts, with a few working in urban areas or larger school districts (such as Sioux Falls, Sioux City and West Des Moines).